My Moleskine reporter notebook is a fixture in my bag. I whip it out when an idea pops in my head, when I am interviewing someone for an article, when I am taking down notes for a potential story, or when I am drawing up a wishlist. Toni, my friend Sarj's hubby calls it my "Inspector notebook" and I like how official it feels when whip it out my bag and slip off the elastic. These days, Moleskine has gone beyond notebooks, planners and travel guidebooks. They recently came out with a collection of travel bags, writing instruments and reading accessories, which are all seriously well-designed, in keeping with Moleskine tradition. The Travelling Collection has everything the modern nomad would need. 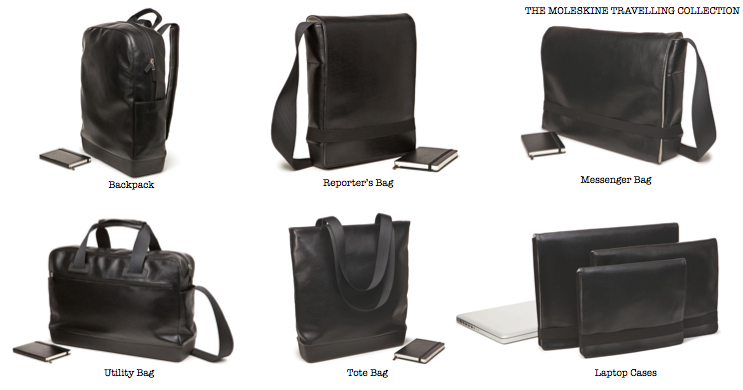 "The Messenger Bag is a robust over-the-shoulder urban carryall. The durable and versatile Tote Bag is made with water-repellent materials and a molded base for added stability; while the stylish Utility Bag features several external and internal pockets with zippers for flexible, secure storage. Chic and compact, the Reporter Bag closely reflects the character of the Moleskine notebook right down to the elastic closure; the Backpack, on the other hand, incorporates adjustable, removable shoulder straps and a molded base to allow the bag to stand when it’s set down. Multipurpose Cases (you can choose from four different sizes) offer storage pouches fitted with Velcro at the rear to keep them attached to the bag lining. Finally, Moleskine Laptop Cases are fitted with stretch fabric, velour lining and light padding to safeguard digital creativity." Don't forget to check out the Reading and Writing Collections, for a vast array of tools that will make reading & writing more enjoyable. The new Moleskine collections are available at National Book Store Greenbelt, Power Plant Mall, SM Mall of Asia and Trinoma. For the full 2011 collection and prices, LIKE the National Bookstore page on Facebook.